After a break in July and August, we started off the new season of conservation volunteer events in muddy style by heading over to Fugelmere Marsh to remove regenerating scrub and saplings. Accessing the marsh is fairly precarious – tread carefully or you can find yourself sinking into its boggy depths. 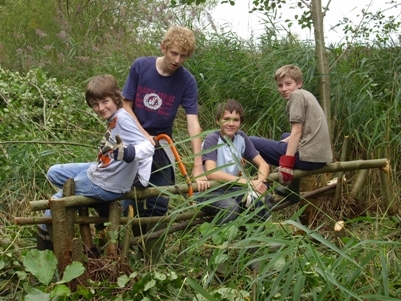 Armed with saws and loppers, we made our way to the centre of the marsh and cleared a wide area of invasive scrub. We also removed some trees from the woodland edge to enhance the wetland habitat. This is a typical task for the volunteers at this time of year, and over the next couple of months you can expect to find us at Fugelmere, Gelvert or North East Marsh. Wellies are a necessity (the Society has a plentiful supply if you feel like joining us) and should water levels become too high we switch to other jobs, such as clearing birch from the Dry Heath or bamboo from Brookly Wood. 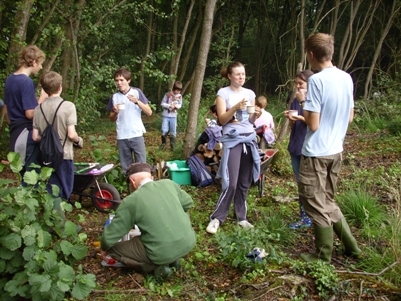 Bird walk at Fleet Pond on Saturday 26 September 2009. Meet at Fleet Pond car park off the A3013 Cove Road at 1.30pm. Join us and local bird expert Peter Hutchins for a walk around the Pond’s woodlands and wetlands as we look for some of the many bird species that can be found on this important wildlife reserve. If you have binoculars please bring them with you. On Thursday 17th September, Joanna Lawence (Fleet Pond Ranger) and Paul Hope (Basingstoke Canal Ranger and local bat expert) led a group of over 20 of us on an evening walk to look and listen for bats around the pond. We walked up to the Dry Heath, where Paul talked about the 17 species of bat found in the UK and which ones we could expect to see at the pond. These included the pipistrelles, the Daubenton’s Bat, also called the ‘water bat’ as it feeds over water, and the Brown Long-eared Bat, known as the ‘whispering bat’ because of its very quiet echolocation calls. We could also expect to pick up the echolocation calls of passing Noctule bats at 25kHz as these can be picked up by bat detectors at a range of 200m. The commonest bat in the UK is the pipistrelle; a single Common Pipistrelle can consume 3000 insects in one night. Its calls range from 40 to 60kHz, with a peak intensity of about 45kHz. Soprano Pipistrelles transmit at a higher echolocation frequency of about 55kHz. Joanna handed out the bat detectors and some glow sticks for the children, and we headed into the woods to listen. All was quiet and very dark, so we made our way down to the marshy areas by the pony paddock. Here, we picked up the calls of both Common and Soprano Pipestrelles, and saw some movement but didn’t get a clear view. Incidentally, as we made our way towards Boathouse Corner, we surprised a group of youngsters who had decided to pitch a tent by the side of the path. The Rangers pointed out that camping at the reserve is illegal (and you also run the risk of a large group of people with torches and bat detectors suddenly descending on you from the darkness of the woods). On the jetty at Boathouse Corner, we picked up the calls of the Daubenton’s Bat at around 45kHz. We saw some movement over the water but didn’t get a clear sighting until we moved further along the path, up to the larger fishing jetty. Here, we could see the occasional Daubenton’s Bat suddenly swooping over the water to feed while the bat detectors still picked up strong calls from nearby Soprano Pipistrelles. Daubenton’s Bats feed on insects by flying low over still or slow-moving water. They are also able to take prey directly from the water’s surface, using their large feet or their tail membrane as a scoop. We had our best sightings from the jetty on the corner of Hemelite Bay, with the water illuminated by lights from the Waterfront Business Park. Paul shone his torch over the pond and followed the flight of a pair of Daubenton’s Bats, chasing each other across the water. It was a mesmerising sight, and despite the cold night we stayed for ages watching these fascinating creatures. National Moth Night (NMN) is Britain’s celebration of moths and moth recording. It was launched in 1999 and has taken place annually since then, the date varying each year in order to focus recording effort on different parts of the season. Atropos (the journal for butterfly, moth and dragonfly enthusiasts) founded the event and it is now run jointly with Butterfly Conservation (the UK charity taking action to save butterflies, moths and their habitats). Picture credits from the second site above. Bat walk at Fleet Pond on Thursday 17 September 2009. Meet at Fleet Station pay & display car park next to the reserve at 7.00pm. 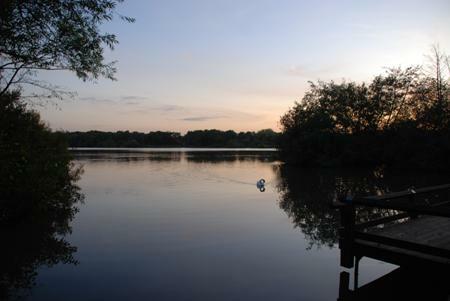 Join local bat expert Paul Hope and Ranger Joanna Lawrence on an evening bat walk to find out more about bats and which ones are using your nature reserve after dark. If you have a bat detector please bring it with you, however, some will be provided. A torch may also be useful if you have one! 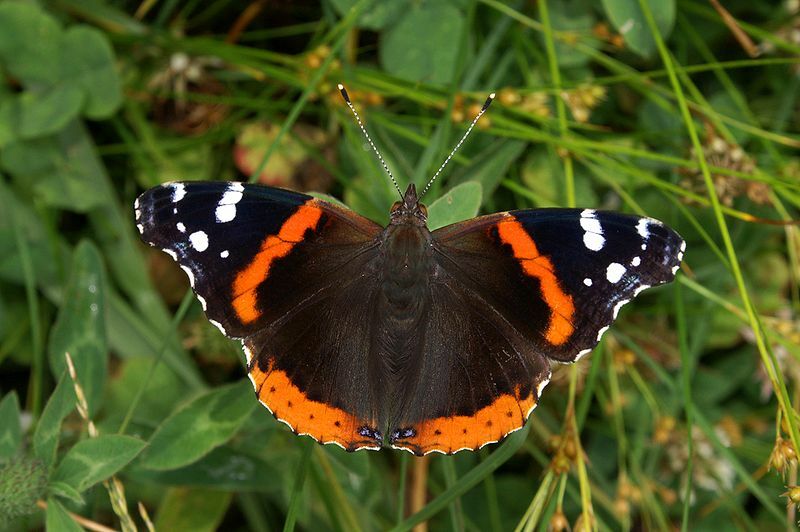 Due to global warming and its ability to over-winter as a butterfly in this Country now, the Red Admiral may be seen flying during any month of the year. I have chosen this species as my butterfly of the month, as I have rather special memories of Red Admirals in September. Barbara and I often holiday on the Isle of Wight at that time of year and, one September, we went to see a “Birds of Prey Display” at Appledurcombe House. After the show had ended, we walked around the House grounds and, to our surprise, came across dozens of Red Admirals nectaring on rotting damsons that had fallen from the trees. The damsons had started fermenting, which caused the Red Admirals to become rather “drunk” and this meant that we could walk among them and inspect them closely. In normal circumstances, they would have flown off before we had the chance to really appreciate their beauty. The butterflies that survive our winter may be seen in small numbers from January onwards on warm, sunny days, but, throughout the spring and summer, home-bred specimens are added to by varying numbers of migrants from North Africa and the Continent. They travel even as far north as the remotest Scottish isles. Red Admiral butterflies lay their eggs singly on the young leaves and shoots of Common Nettle leaves in sunny positions. There are two forms of caterpillar – some yellowish, some blackish – and, when they emerge after about a week, each makes a little tent by doubling up a leaf and fastening the ends with silk. Over the next four weeks, it feeds in a succession of leaf-tents. When it is full-size, it spins two of three nettle leaves together and pupates within this tent. The butterfly emerges after about three weeks. The greatest number of Red Admirals seen in any month is probably during early September when they can nectar on Buddleia flowers. By pruning these plants in March, the Buddleias are usually at their best when there are fewer other flowers for the butterflies to gain nectar from. As well as damsons, Red Admirals like other rotting fruit, so, if you can put up with any wasps that might be attracted, leave a few rotting apples of plums for them. You are currently browsing the Fleet Pond Blog blog archives for September, 2009.